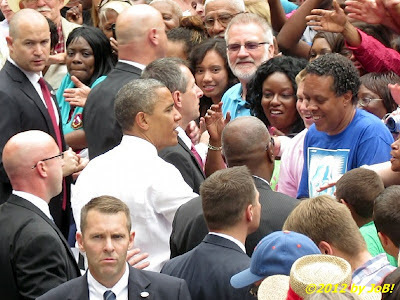 President Barack Obama greets supports at the conclusion of the "Grassroots Event" held at Cincinnati's Eden Park on Monday afternoon. 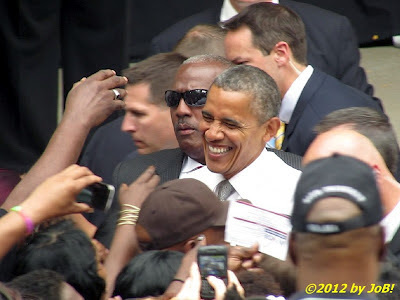 CINCINNATI, OH -- President Barack Obama made his twelfth trip to Ohio on Monday with a "Grassroots Event" stop in Cincinnati early Monday afternoon in the city's Mount Adams neighborhood area. 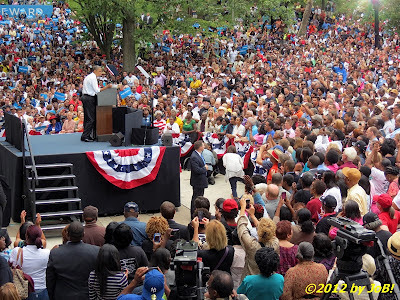 Addressing a crowd of approximately 4,500 supporters at the Seasongood Pavilion in Eden Park, Obama stressed the stark differences between his campaign and that of his opponent, former Massachusetts governor Mitt Romney, and the decision voters will have to make over the next 50 days concerning the direction the country takes for the next four years. He told the gathering that "it's not just between two candidates or two political parties, but it is a choice between two fundamentally different visions on how we move forward as a country." 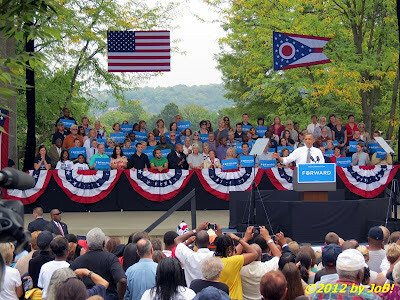 President Obama delivers campaign remarks at the "Grassroots Event" at Cincinnati's Eden Park on Monday afternoon. Obama started his prepared remarks by bringing up the subject of tax cuts and his record on keeping taxes low for middle-class families and small businesses or, as the president described those people, "folks who need it." He mocked the Republicans' call for campaigning on the issue of providing more tax cuts for the richest Americans but not providing any details on how they would pay for them. The president then expressed his desire to create an economy that "grows from the middle out--from a strong middle class, from strong working families" which creates "a virtuous cycle--going up, going forward." Part of the estimated 4,500 people who attended the Obama "Grassroots Event" at Cincinnati's Eden Park on Monday afternoon. With an approach that stresses a bargain with the country's middle class citizens, the president laid out a four-point plan that focuses on manufacturing, education, energy and deficit reduction, and national defense. "The path we offer may be harder, but it leads to a better place," implored Obama, "and I'm asking you to choose that future." 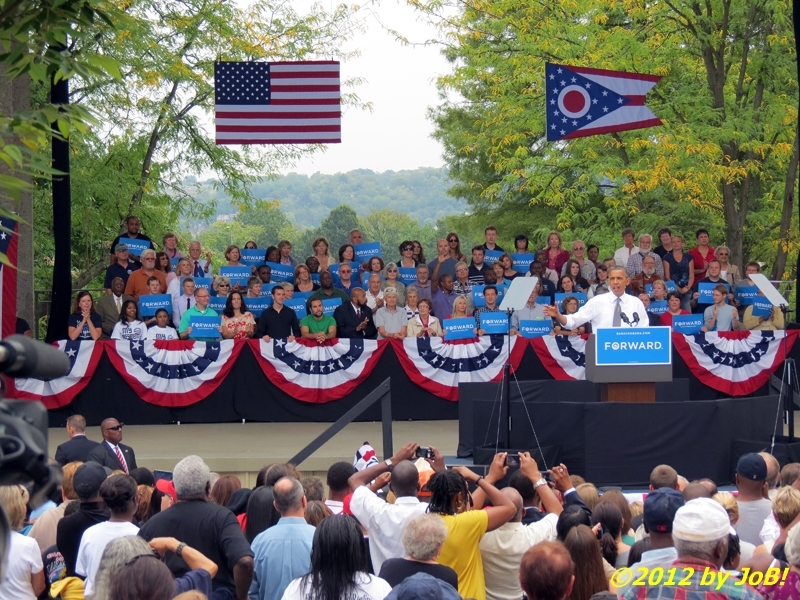 On the manufacturing front, the president touted successes seen on both the national level and within Ohio. "After a decade of decline, this country has now created over half a million new manufacturing jobs in the last two and a half years, a whole lot of them here in Ohio," Obama stated, pointing to his administration's bailout of the US automobile industry in 2009 which has provided nearly 250,000 of that overall total and has a goal of adding one million new jobs in the next four years. His plan also rewards companies and corporations that open manufacturing plants in the United States instead of outsourcing those jobs to overseas locations. 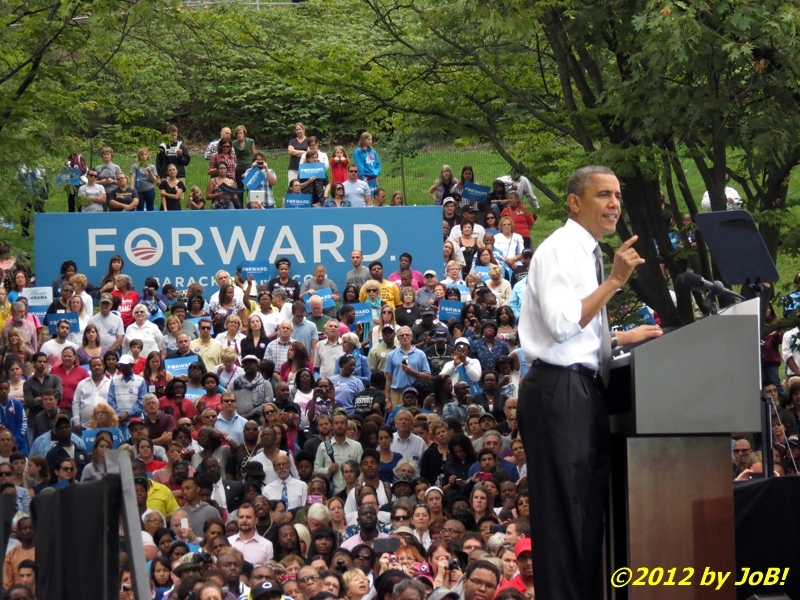 President Obama takes the stage during the "Grassroots Event" at Cincinnati's Eden Park on Monday afternoon. Referring to China specifically, he compared his successes on bringing more unfair trade cases against that nation in his current term than the Bush administration did in two as well as winning every brought case that has been decided. Many morning papers featured a new action against that nation, related to the illegal payments made to auto parts manufacturers to relocate their businesses there. 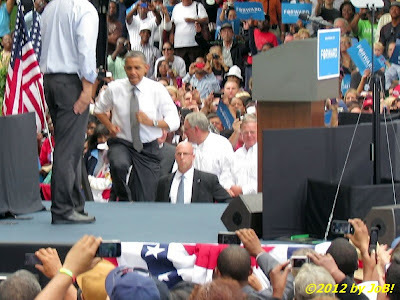 "These are subsidies that directly harm working and women on the assembly lines in Ohio and Michigan and across the Midwest," and Obama singled out efforts by Ohio Senator Sherrod Brown to fight in the Congress to oppose those illegal practices. 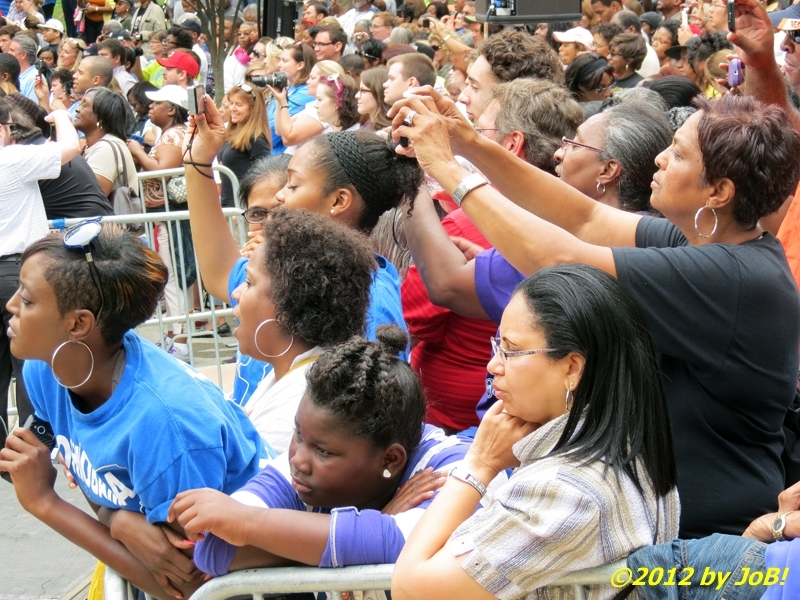 Supporters listen to President Obama's remarks at the "Grassroots Event" held at Cincinnati's Eden Park on Monday afternoon. Pivoting to education, the president called it "the gateway to a middle-class life" and reminded those in attendance of his administration's record on supporting initiatives such as the expansion of Pell Grants, reforming the federal student loan process, and stressing the importance of workers learning new skills through the nation's community college system that are vital to today's job market. 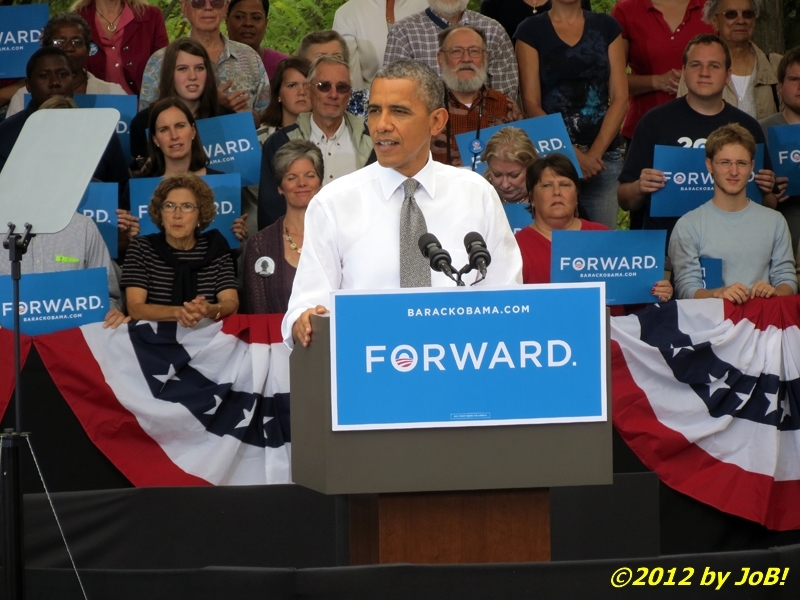 In contrast, Obama stated that his opponent would slash or eliminate these programs in order to help fund proposed tax cuts targeted for the richest American families. As the third component, the president spoke about efforts towards furthering energy independence, a move seen as vital to national security as well as the environment. It is estimated that increasing fuel efficiency standards for cars and trucks, doubling renewable energy sources like wind and solar, exploring clean coal and biofuel options, and tapping into a nearly 100-year supply of natural gas reserves can collectively lead to a halving of US oil imports by 2020 and a significant increase in American jobs to support indigenous energy efforts. 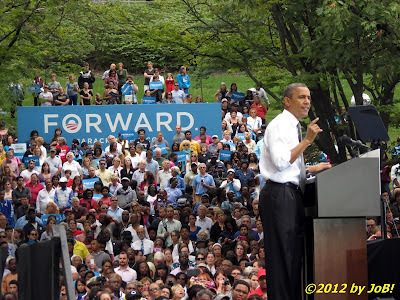 Obama reminded the crowd about his personal initiatives towards reducing the national deficit, which includes an already enacted $1 trillion cut in spending in 2011 and a proposed $4 trillion plan that was ultimately rejected by House Republican leaders. The president affirmed his desire to reform the tax code and to increase the rates on incomes over $250,000 to "the same rate we had when Bill Clinton was President; the same rate we had when the economy created nearly 23 million new jobs, the biggest surplus in history, and we helped a lot of millionaires to boot." This is in direct contrast to the Romney plan which would increase spending over the next 10 years by $5 trillion on tax cuts for that same group, which come on top of the current Bush-era cuts, and by an additional $2 trillion on increased defense spending. Because neither Romney nor his running mate, Wisconsin Representative Paul Ryan, have addressed how those increases would be paid for, the president said that "the only thing they can do is to keep trying to bluff their way through until November and hope that you won’t call them on it." He also affirmed his administration's support for Medicare and Social Security by taking steps to reform and strengthen both without privatization. 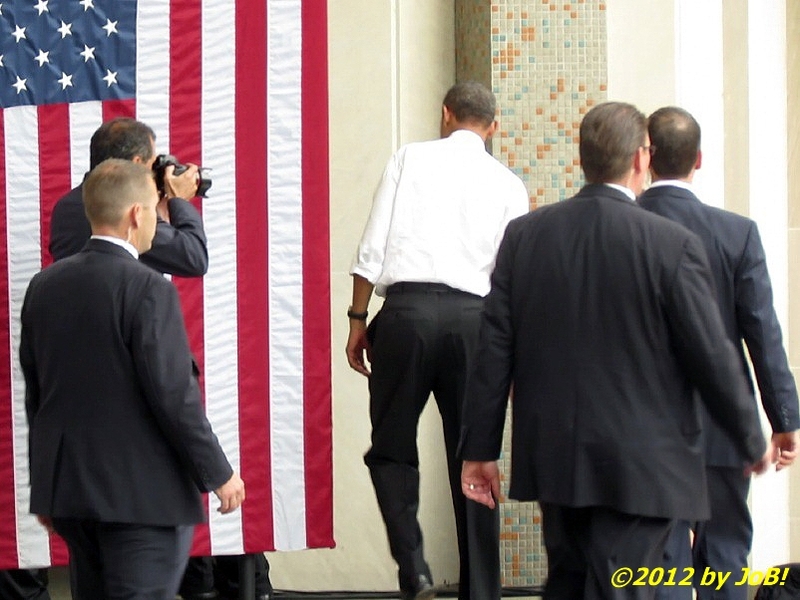 Referring to the current Middle Eastern tensions, Obama linked the nation's domestic prosperity to its foreign policies. Citing accomplishments such as the end of the Iraq War, the winding down of operations in Afghanistan, and the actions taken against al Qaeda--to include the killing of Osama bin Laden, the president stated that continued engagement and involvement in world affairs remains vital to American security. While maintaining the military's current strength and capabilities, he stands in opposition to Romney's proposed defense increases and would spend those funds to "do some nation building here at home" with infrastructure improvements and debt reduction heading the list. In closing, Obama again reminded the audience of how he and his opponent differ about the direction the country may go after the November election and that they and the country, cannot turn back now. "As citizens," the president stated, "we understand America is not just what can be done for us. It’s about what can be done by us, together, as one nation, as one people." 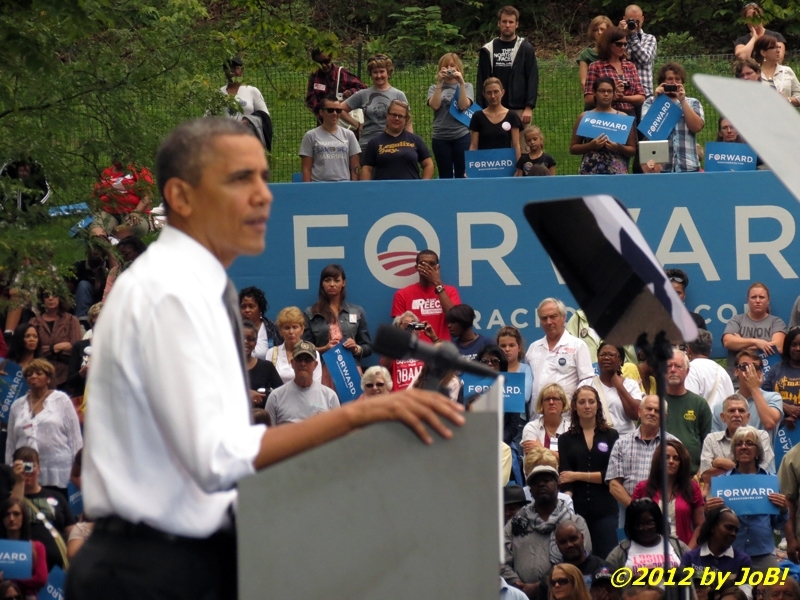 In addition to highlighted the upcoming voting registration deadline (October 9th) and the date that early voting begins in Ohio (October 2nd), Obama directed those not yet registered to cast their ballot to visit the campaign's Gottavote.com to find out how and where to do so. 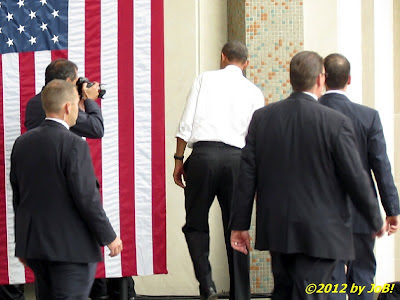 At the conclusion of his speech, the president spent several minutes greeting supporters and well-wishers before his motorcade returned him to Air Force One for the short flight to Columbus and his second Ohio event of the day. President Barack Obama leaves the stage at the conclusion of the "Grassroots Event" held at Cincinnati's Eden Park on Monday afternoon. As a "swing state", Ohio's 18 electoral votes factor heavily into a close general election contest and the Obama campaign has seen its continuous presence in the state, both in person and via media outlets, paying big dividends in recent weeks. 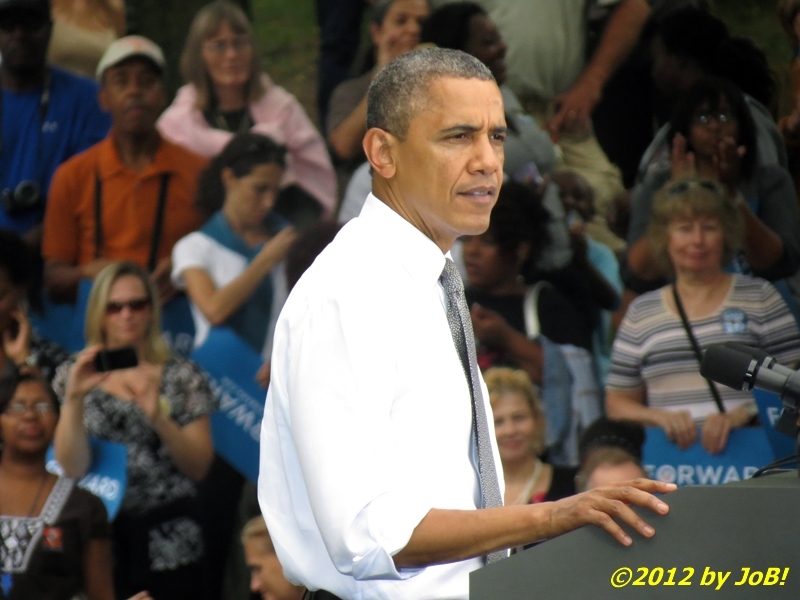 Current polling shows the president with a four- to five-point average lead and one that is very close to the advantage Obama had over Arizona senator John McCain for the 2008 general election. Losing Ohio, a state that every successful GOP presidential candidate has carried in securing the White House, would put the 270 electoral vote total needed to win the election nearly out of reach for the Republican challenger.